Gurukul Kangri University is a famous university in India and every year so many students are come here for their studies. It is situated in the Holy districts Haridwar of the Uttarakhand state. The University is approx. 5 kms from main Haridwar city and on the Haridwar Delhi Highway in the peaceful place. 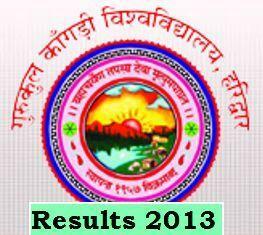 So as of now Gurukul Kangri University has declared the B.Sc (bachelor of education) results of the session 2012-13. All those students who are waiting for their result now can check the result online. Every year many students are appeared for various courses in the Gurukul Kangri University. Here Below I am giving a link to get your B.Sc results online. You can check your B.Sc 1st Year, B.Sc 2nd Year and B.Sc 3rd year or final year result by the given link. So just click on the given link and then you will get roll no. option in it and then fill your roll number on it and click to submit button. So after that you will get you results along with all the subject wise marks details. Click here to get your B.Sc results. For more updates stay connected with our site or you may simply subscribe us by your email id. I wish you all the best for your results.